She's Fantastic: Magic the Gathering - LILIANA VESS! Magic the Gathering - LILIANA VESS! The Magic the Gathering Legacy Collection was by far the most exciting thing I saw at Toy Fair 2014. There was an announcement several weeks before the Fair about the Game of Thrones Legacy Collection from Funko and I think most collectors were ecstatic to have a new player in the 6-7" action figure market. I certainly was. But that excitement was taken to a new level when I walked into the Funko booth and saw these Magic the Gathering figures. They looked like they had very similar bucks to the wildly popular MOTUC figures and the character designs were fantastical. I used to play Magic in the mid-90s but never stuck with it. Over the years, I was aware of various comics and "expanded universes", but I had no idea there were actual developed characters now. 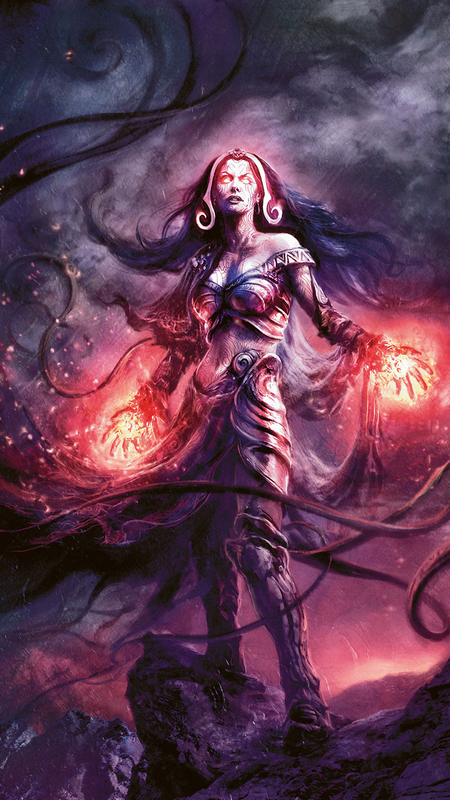 Liliana Vess is a Planeswalker Necromancer with a very detailed backstory. She has been featured on twelve MTG cards and referenced on another seventeen. I learn new things every day. Let's check out Liliana in detail below! Sculpted by Gentle Giant Studios! I'm glad their partnership is going strong. Interesting thing I learned from the packaging: Magic the Gathering is a trademark of Wizards of the Coast, which is in turn a trademark of Hasbro. I was alarmed for a second when I saw Hasbro in the fine print but then I figured it all out. I love this beautifully wicked looking lady. Her sculpt and paint is near perfect. Her gold headpiece is sculpted out of a super-flexible rubbery plastic. So if you see one in the package where those curls look all asymmetrical, don't fret. Mine looked like that, but if you just position it against her hair the way you want it, it will stay put. The articulation on these figures is amazing. They are very similar to MOTUC ladies but with the addition of Hinge-and-swivel wrists, double-jointed knees, Hinge-and-swivel feet, and a ribcage cut instead of waist. The ribcage joint is interesting because the post in that rises form the abdomen to anchor in the upper torso is actually a ball joint in her belly (there's a picture of her dismembered below). It's very similar to a lot of neck articulation I've seen. Okay. This figure is fantastic, but I have to highlight the few flaws I found. 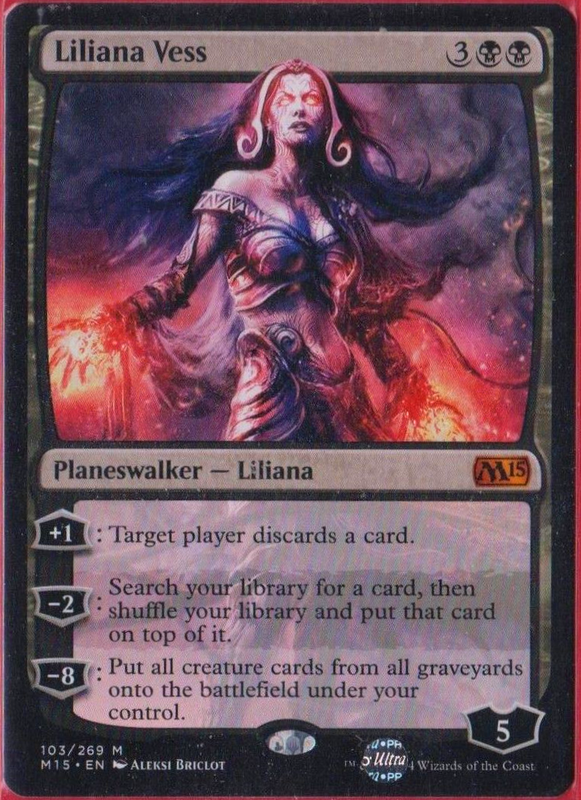 (1) Similar to the GOT Daenerys, Liliana's torso joint pops apart really easily. This isn't a major cause for concern with me (also, it's the only one of the three MtG females I am reviewing that has this issue, so it's definitely not systemic). (2) Her (sculpted) cloth piece that connects from her back to her wrist came detached at her left wrist. It's important to note that nothing tore or actually broke here. You can see in the second photo that there is a peg and hole system to make it stay in place. I'm thinking there was also some type of adhesive holding this in which either dissolved, was non-existent, or is now a nondescript sticky ball in my carpet. I'll glue it back in place later (it does not stay in place with just the shallow peg). And finally (3) Her left shoulder doesn't want to move at all. It's under all that soft rubber shoulder ornamentation so it's hard to get to, but I tried forcing it up until the breaking point and it won't budge. I'll try the hot water trick later. 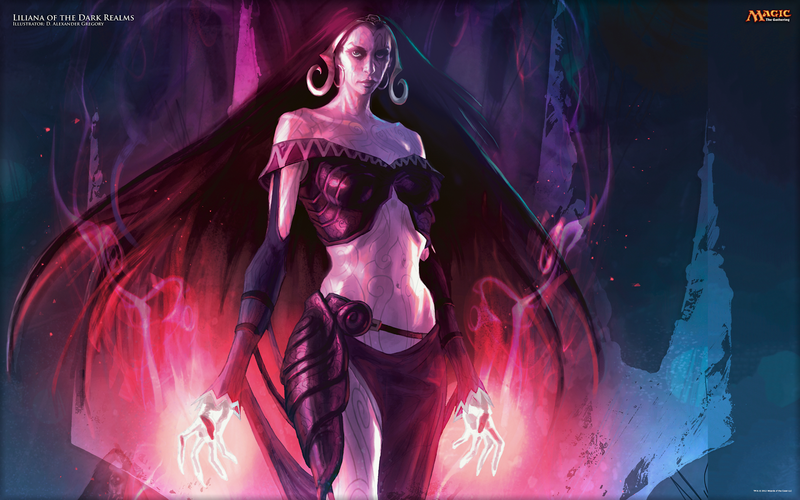 Here is some MtG art of Liliana Vess. Her face sculpt is extremely impressive. I can't wait for more from Funko! I'll be posting reviews of the other two MtG ladies in the next two days. I'm a little bummed that she wasn't made a smidgen larger so this buck could blend in with MOTUC figures. Looks great. I too been looking forward to this figures. Specially the one with fire hair. It seems Funko still has some production issues (as has been reported with GOT figures) and hey, at least they don't have to look like any actor ( my mainn reason for not collecting any GOT). Looking forward to the next two reviews. I got excited and posted both remaining reviews in the same sitting (technically one before and one after midnight so they're on different days). I love these figures and I can't wait for more. The flame hair girl (Chandra) is definitely my favorite, but they're awesome as a group, too. So your figure has a small blotch of paint on her right golden headdress hoop and a far bigger blotch of paint on her right hand, and yet you're exstatic about it? As for my figure, I cannot move her left leg at the hip joint back or forth, and generally have a hard time keeping her from falling on her back. Funko really dropped the ball on this one. I'm a hopeless optimist most of the time. To be honest, I'm not sure I even noticed the big smudge on her hand. It's pretty clear that it's from the band of cloth that connects to her wrists. My ecstatic-ness was more about the potential of a new line, new characters, and an overall new presence in the toy aisles. Have you tried running the joints under hot water to loosen them? It usually does the trick. As far as her toppling over, mine tend to do the same. I often used a black Kaiser doll stand to keep them upright. They aren't that noticeable. I get mine on Amazon. Good luck!